Avocados and zucchini noodles (“zoodles”) are the stars in this new take on a traditional Vietnamese noodle salad bowl. Every member of your family will be asking for more when this is served up. In a small bowl combine soy sauce, garlic, green onion, red pepper flakes and 2 teaspoons of the sesame oil. In a shallow bowl combine tofu and 2 teaspoons of the soy mixture. Let stand 10 minutes. In a large non-stick skillet heat 1 teaspoon of the sesame oil over medium heat. Pat the tofu dry and cook until golden brown on each side. Remove from heat to a plate; set aside. Add zucchini noodles to the same skillet. Cook, over medium heat, stirring frequently about 5 minutes until hot and softened. Let cool. Turn into a large shallow serving bowl. Add lettuce, sprouts, and carrots to bowl. 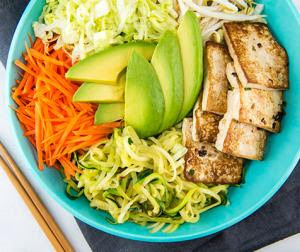 Top bowl with tofu and avocado. Add lime juice to soy mixture; drizzle over noodle bowl. Toss before serving. Top with cilantro leaves or replace the tofu with chicken or shrimp. I love your healthy new take on a traditional Vietnamese noodle salad bowl.I am so glad you shared your delicious Avocado and zucchini noodles recipe with us at the Plant-Based Potluck Party. I'm pinning and sharing.